Video projectors have long been used as a presentation tool in business and commercial entertainment, as well as in some very high-end home theater systems. However, video projectors are becoming more available and affordable for the average consumer. Check out some useful tips before you buy your first video projector. There are two major types of Video Projectors available: DLP (Digital Light Processing) and LCD (Liquid Crystal Display). Other variants of LCD video projection technology in use include LCOS (Liquid Crystal on Silicon), D-ILA (Digital Imaging Light Amplification - developed and used by JVC) and SXRD (Silicon Crystal Reflective Display — developed and used by Sony). DLP projectors employ a light source in combination with a color wheel and chip that contains microscopic tilting mirrors. The light passes through the color wheel, reflects off the mirrors and is then projected on a screen. LCD projectors utilize a light source that passes light through 3 LCD Chips (assigned to primary colors red, green, and blue) to create and project images. With LCOS/D-ILA and SXRD projectors, the light source is reflected off the 3 LCD chips, instead of passing through them. In addition to the core LCD or DLP technology that may be used in a video projector, another thing to take into consideration is whether the light source used in the projector is a ​lamp, LED, or Laser. All three options have their advantages and disadvantages. Video projectors that use lamps need to be changed after about 3,000 to 4,000 hours of viewing. However, some projectors have upwards of 5,000 hours. Video projectors that use LEDs and/or Lasers as light sources have a much longer life, as much as 20,000 hours or more. Compare video projector light source life with an LED/LCD or OLED TV which can last 60,000 hours or more, albeit with smaller screen size. Without sufficient light output, a projector will not be able to display a bright image. If light output is too low an image will look muddy and soft, even in a dark room. The best way to determine if a projector outputs enough light to produce bright images, check the ANSI Lumens rating. This will tell you how much light that a projector can put out. Relatively speaking, projectors with 1,000 ANSI Lumens or greater have sufficient brightness for home theater use. Room size, screen size/distance, and ambient room light connections will also affect the need for more or fewer lumens. LCD and DLP projectors output light differently. LCD projectors output the same amount of white and color light whereas DLP projectors output more white light than color light. Although video projector light output capability has improved, they still work best in a darkened room. Contrast ratio complements brightness. Contrast is the ratio between the black and white portions of the image. High contrast ratios deliver whiter whites and blacker blacks. A projector may have a great Lumens rating, but if the contrast ratio is low, your image will look washed out. In a darkened room, a contrast ratio of at least 1,500:1 is good, but 2,000:1 or higher is considered excellent. Pixel Density (aka display resolution) is important. LCD and DLP projectors have a fixed number of pixels. If most of your viewing is HDTV, get as high a native pixel count as possible (preferably 1920x1080). A native pixel count of 1024x768 is sufficient for DVD. However, 720p HDTV signals require a 1280x720 pixel count for native display, while a 1080i HDTV input signal needs a native pixel count of 1920x1080. If you have a Blu-ray Disc player, consider a projector with 1920x1080 native pixel resolution and the ability to display the 1080p format. If you desire to jump into 4K, aside from the increased expense, not all 4K projectors project true 4K resolution. It is important that you understand how 4K video projectors work and how they are labeled so that you can make the right choice for a home theater setup. To get the most out of 4K projector you need to provide with 4K content from an Ultra HD Blu-ray player or 4K streaming sources (such as Netflix or Vudu). Color Reproduction is another factor. Check for natural flesh tones and color depth. Check how colors look in the brightest and darkest areas of the image. 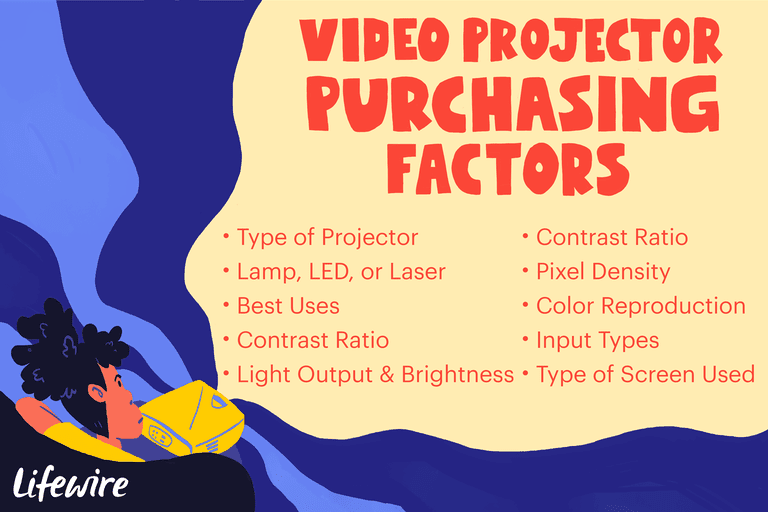 Check the degree of color stability from input to input, and that you get familiar with the types of picture settings that video projectors offer. Everyone has a slight difference in color perception and what looks pleasing. Look carefully. Make sure the projector has the inputs you need. All video projectors these days, provide HDMI inputs, and most projectors also have VGA and/or DVI inputs for computers. However, if you have older source components that have composite, S-video or component video outputs, many newer video projectors no longer offer these options or may offer just composite video inputs. This means that when shopping for a projector, it is definitely important to make sure that it has the connections that you need. Some video projectors include audio inputs and onboard speakers, but like speakers built into TVs, are not that effective. It is best to connect your audio source to an external audio system (even a modest one) for a better movie watching experience. Screens come in various fabrics, sizes, and prices. The type of screen that's best depends on the projector, the viewing angle, the amount of ambient light in the room, and the distance of the projector from the screen. If you have a small room, consider a Short Throw projector which can display very large images from a shorter distance. Portability is important, not just enabling you to move or travel with your projector, but simplifying installation and setup. It also makes it easy to try different screen sizes, distances, and different rooms to see what works best. If your projector is portable you can even hang a sheet on an outside wall (or garage door) in the summertime and enjoy your own drive-in movies! Watching movies outdoors using a video projector can be a great experience. Some compact projectors come with carrying bags or cases. A home theater setup with a video projector at its centerpiece can really elevate the home entertainment experience. However, just don't reach into your wallet and by what is on special or hyped. Video projector prices vary widely from several hundred to several thousand dollars depending on the factors discussed above and, unless projecting onto a wall, you also have to take the cost of a screen, which also comes in similar price ranges, into consideration.